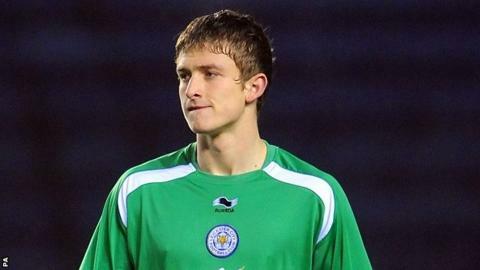 Cambridge United have signed Leicester City goalkeeper Adam Smith on loan until the end of the season. The U's required special permission from the Conference to bring in Smith after regular incumbent Will Norris picked up a foot injury. The 22-year-old will be eligible for the Conference Premier play-offs, which Cambridge have already qualified for. He has not played for the Foxes and had a loan spell earlier this season at Stevenage, where he failed to play. U's director of football Jez George said: "The Conference have been really understanding of our situation." Smith will be part of the squad for Saturday's final league game of the season at Gateshead and then their two or three play-off games. George continued: "The situation was not of our making. Throughout this whole process we have acted with honesty and integrity, while trying to look after our football club within the spirit of the competition. "We've had to be patient in finding the right man and be realistic with who we can bring in. If we were only able to bring in a goalkeeper from the level below, it would have been impossible to sign someone before Saturday. "We didn't want to have to go to Gateshead and play an outfield player in goal, which is what we would have had to do. We're really pleased to have been able to sign someone of Adam's calibre and we are extremely grateful to Leicester City for allowing the move to happen."